To keep a model’s sales flowing, there are two or three ways to proceed, ranging from simple (purchase incentives) to very expensive (start from scratch and design a whole new vehicle). Nissan recently invited us to get behind the wheel of the 2016 Altima, and I was anxious to see what strategy the automaker used to revive its midsize sedan. Even if it didn’t receive a new chassis, the latest iteration of the Nissan Altima is visually different from the model it replaces. The front end is sharper, the headlamp clusters now incorporate LED lighting (although base trims get a reflective band instead of the LED strip), the front bumper was reshaped and Nissan’s proprietary V-Motion grille has been prominently installed on the car. The overall package looks a lot like the new Maxima. The rear end also received some attention. Thanks to new, pointy-shaped taillights similar to the ones found on the Maxima and the Sentra, in addition to a revised bumper, it will be relatively easy to spot a 2016 Altima from its predecessors. The car’s drag coefficient has been improved from 0.29 to 0.26, making the 2016 Altima as aerodynamic as the GT-R. In my humble opinion, Nissan’s stylists accomplished their mission in making the Altima more attractive without changing the car’s platform or basic shape. The cockpit also got a makeover. The centre console was redesigned to be slimmer and incorporate the latest version of the company’s infotainment system, while their Zero Gravity seats are now fitted as standard. By the way, even if the front seats in the Maxima and Murano bear the same name, their design differs between models; Zero Gravity is a technology, not a unique seat model. The Altima’s chairs are comfortable, but we’d like a little more lateral support during tight cornering manoeuvres. Actually, very few owners drive their Altima on a track, so this isn’t a major drawback. One of the most significant improvements in the 2016 Altima isn’t something you see, but hear. Engineers spend a lot of time working on the car’s interior decibel levels, replacing sound-deadening materials under the dashboard and using insulated glass for the windscreen. The engine mounts were also designed to eliminate vibration, while the central muffler is bigger to filter out more noise. The final result is impressive: after only a few minutes at the helm of the 2016 Nissan Altima, we arrived at a stop sign, and after the car was completely immobilized, it took us a few seconds to realize that the engine was still running, and wasn’t equipped with an automatic start/stop system. A new version of the Altima is making its appearance for 2016: positioned between S and SV trims, slightly below the SL, but more upscale than the base version (are you still following us? ), the SR is a “sporty” edition of the sedan. It gets some visual distinctions such as 18-inch wheels, black-painted headlamp clusters, a rear spoiler and fog lamps. The cockpit is highlighted by leather-wrapped wheel and shift knob as well as wheel-mounted paddle shifters. From a performance standpoint, changes are minimal; the Altima SR gets stiffer anti-roll bars, and that’s about it. It’s available with the 2.5-litre four-cylinder engine – that develops 182 horsepower and 180 lb-ft of torque – or the good old 3.5-litre V6 and its 270 horses. In every version of the Altima, the transmission is a newly developed Xtronic CVT automatic; just like in the Maxima, this gearbox is clearly superior to the old generation, and still simulates gear shifts for a more natural driving experience. In normal driving during our test, the 2.5L engine never climbed above 1,800 rpm. The 2016 Nissan Altima’s drive hasn’t changed dramatically, the power steering is still over-assisted (although slightly less so than last year), power is calmly transferred to the road and the overall experience is very serene. The SR edition reduces body roll a little in curves, but doesn’t feel overly sporty. Every version is surprisingly quiet inside, and we can easily cover several hundred kilometres in a day without feeling uncomfortable. 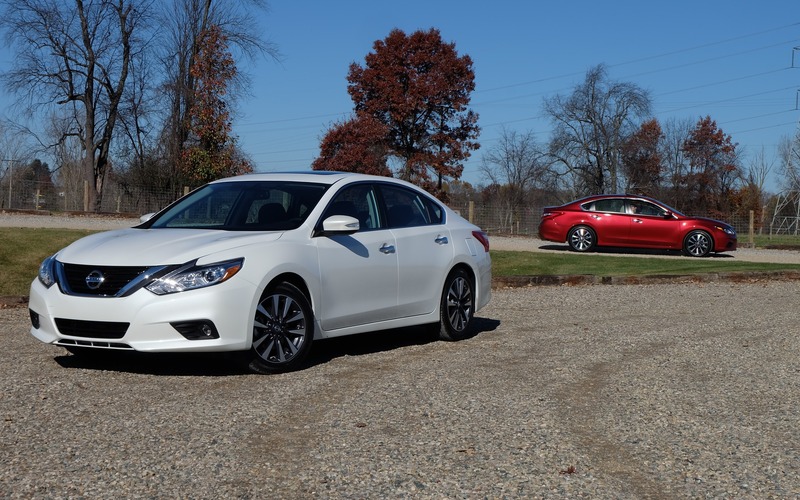 To me, the 2016 Nissan Altima represents the perfect definition of a model update. The Japanese brand gave its sedan a much more modern look, but didn’t lose any of its attributes that make it so popular: a proven powertrain, an admirable level of comfort and impressive reliability. 8/10	In a segment where reliability and comfort are more important than driving dynamics, the Nissan Altima remains a safe bet.